New Delhi: Japan International Cooperation Agency (JICA) today inked a pact with the Centre to provide 82.434 billion yen (about ₹4,870 crore) assistance for Ahmedabad Metro Rail Project. With this pact, the cumulative loan amount provided by JICA for metro projects in India (including Delhi, Chennai, Bengaluru, Kolkata and Mumbai Metro’s) has exceeded 1 trillion yen (approximately ₹59,071 crore). “JICA today signed an agreement with the Government of India to provide 82.434 billion Japanese Yen Official Development Assistance (ODA) loan for the development of the metro rail system in Ahmedabad, Gujarat,” a JICA statement said. It said the ODA loan’s conditions are very concessional, 1.4 per cent of interest rate and 30 years of repayment period (including 10 years grace period). The assistance from JICA will facilitate construction of underground and elevated rail tracks, electrical, telecom and signalling systems and procurement of the trains, it said. India is JICA’s largest partner in the world. The latest agreement was signed between Takema Sakamoto, Chief Representative, JICA India Office and S Selvakumar, Joint Secretary, Department of Economic Affairs, Ministry of Finance. “The project will provide the 1st Metro Rail System network of approx 38 km in Ahmedabad from Motera Stadium to APMC (North-South Corridor) and Thaltej to Vastral Gaam (East-West Corridor),” the statement said. It will cover the central business district area, academic area, residential area and institutional complex area of Ahmedabad Metropolitan Area. Development of metro in Ahmedabad will be a typical example of high quality infrastructure, it added. The Executing agency for the project is Metro Link Express for Gandhinagar and Ahmedabad Company Ltd (MEGA). The complete commercial operation is expected to start from 2020. JICA India Chief representative Sakamoto said: “Ahmedabad is the fifth most populated city in India. 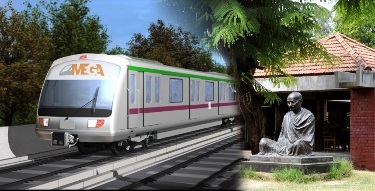 This loan will help develop mass rapid transit system in the Ahmedabad metropolitan area. “This project will meet the growing traffic demands, leading to modal shift from road traffic to public transportation system and will eventually lead to balanced regional development and improvement of environmental conditions,” he said. The technology being implemented for metro will include the advanced singling system, Communication Based Train Control (CBTC), in order to achieve high level of safety enforcement and reliability of the Project.